I really wanted a terarrium to display in my new living room…Unfortunately, I didn’t have $90 to drop on a pre-made one. SO, I used a little ingenuity and bought stuff to make my own! Originally, I was going to go full terrarium with this aloe plant, but when I got it home I liked how tall it was just growing out the top of the container. So I adjusted my plans a little. If you wanna go full terrarium, just follow this little tutorial and plant the aloe plant where the top of the leaves are sitting just inside the container. 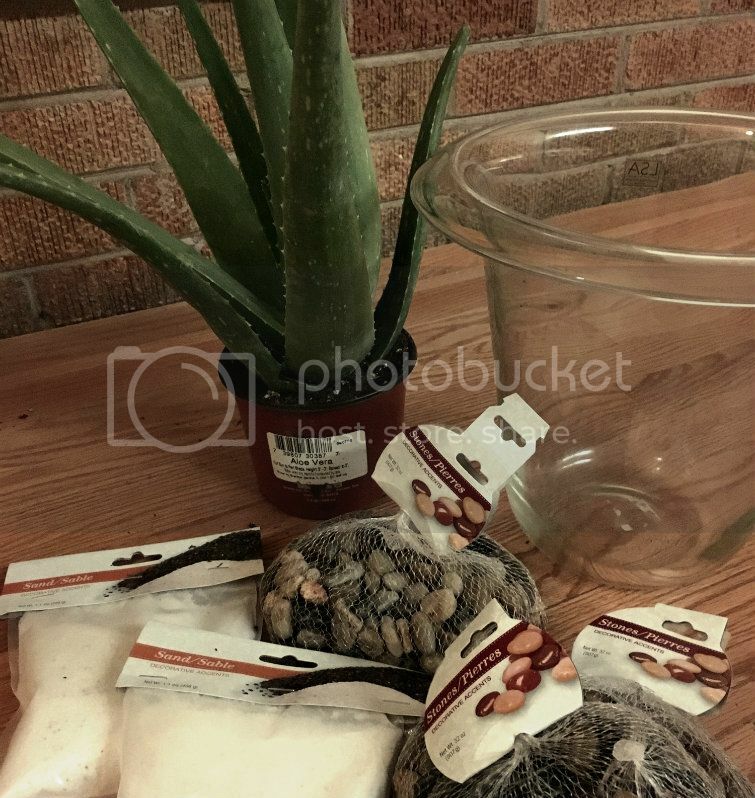 Aloe plant - this was the most expensive at $9.99 from ACE Hardware…but it’s owned locally and I don’t mind paying more to help a local business owner! The Container: You can make a terrarium out of any clear glass container…Mason jars, wine glasses, fish bowls…Just use your imagination! I bet you can come up with a cheap alternative to the fancy schmancy geometric containers. 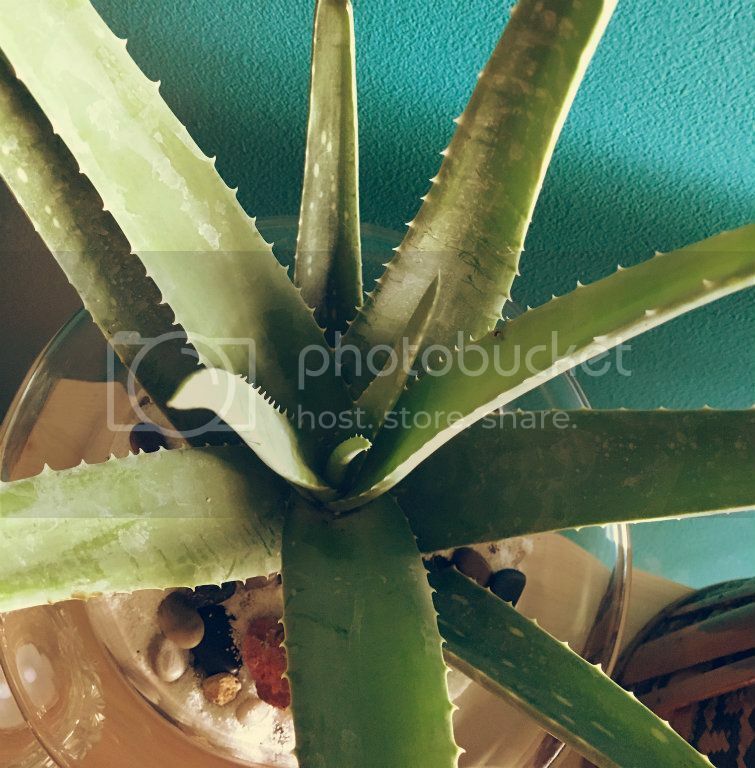 The Plant: I chose aloe because it has healing properties and is great for your skin. Plus, my grandma used to have one in her windowsill and I remember her using it for all kinds of things. If you’re not into aloe, you can use any type of plant that can be planted shallow (succulents…cacti…anything that isn’t a huge fan of water). 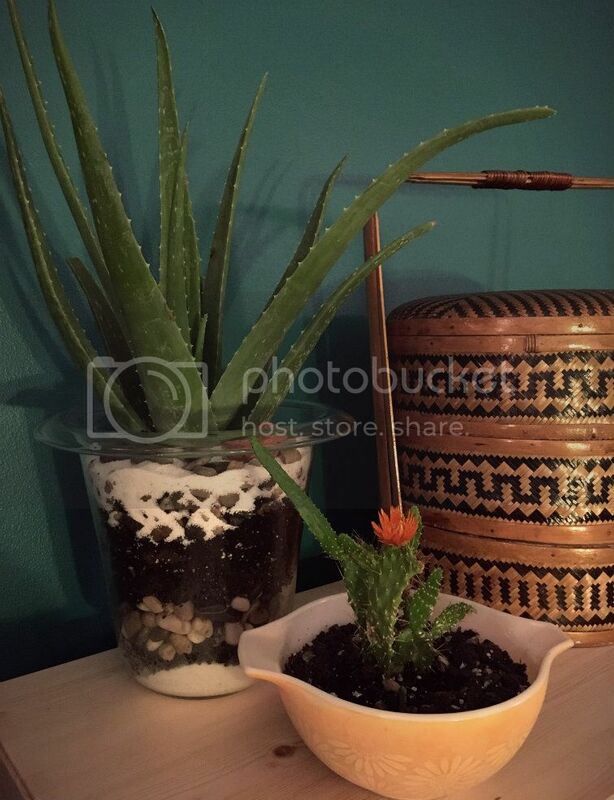 Aloe likes to be in well-draining potting mix and doesn’t like to be in direct sunlight. So I chose some natural looking rocks to mix in with my dirt to help with drainage. What to do: The design will ultimately be dictated by how deep your container is. My container was tall and I ended up filling it almost completely, so I decided a few “natural” looking layers of sand and rock would look nice and help with drainage. I started out with a layer of white sand at the bottom of my container. I made sure it wasn’t perfectly straight across because I wanted it to look more natural, but if straight lines are your thing, go for it! I then proceeded to add a layer of rocks and then added a layer of dirt with a few rocks mixed in. 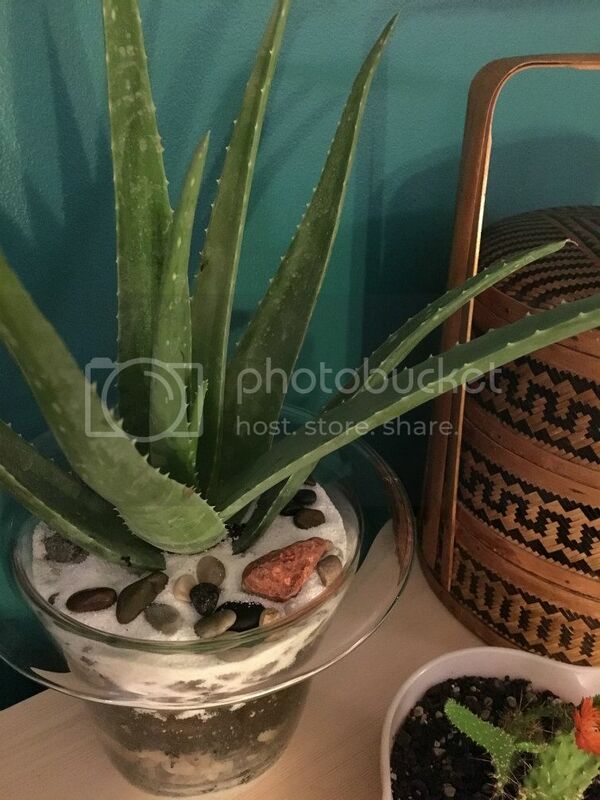 I continued adding dirt in the center and then putting rocks around the outside to make it look like a rock layer and planted my aloe plant in the center. 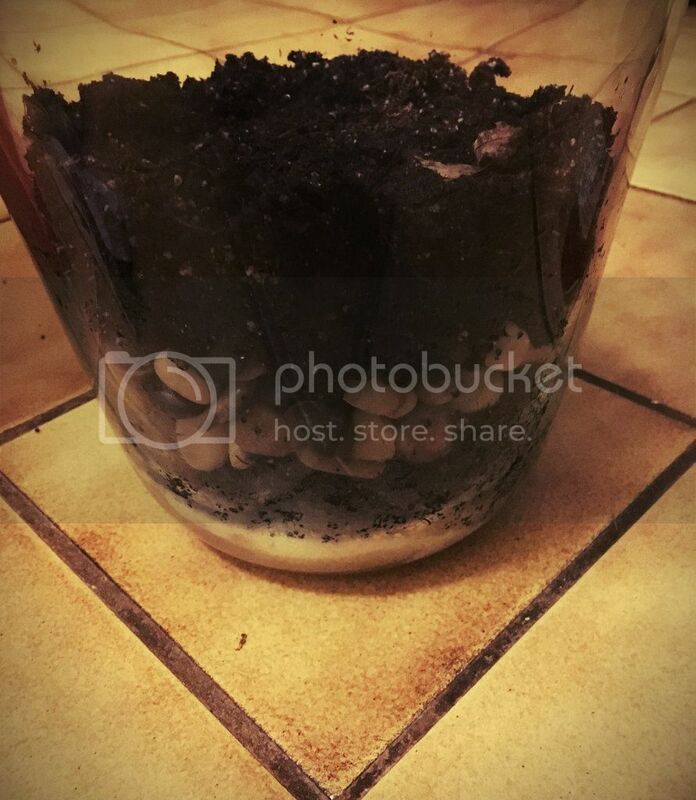 I filled the center with more dirt and filled the top with a layer of rocks and white sand. I placed a few nicely colored large rocks I picked up in the back yard on top of the white sand for a contrast and placed it on my record shelving unit in the living room!